This week I have taken a break from my Starry Nights to make a quilt block for Nicole at Modern Handcraft. As part of the ScrapBeelicious Bee, Nicole asked for Christmas inspired blocks which put me into an absolute blind panic. You see the truth is I do not understand Christmas quilts. It may be because where I am from it tends to be about 90 degrees + on Christmas day and a quilt is the last thing on earth you want anywhere near you. It may be because I do not understand making a quilt that you use, at most, one month of the year. Do not get me wrong, I LOVE Christmas, I just do not get Christmas quilts. So with that in mind I pondered what to do for this month’s blocks…. and this is what I came up with. A scrappy snowflake star. Nicole did say her colours where white, grey and red. Okay it does not scream Christmas but it is very pretty. I mashed up two of Carol Doak’s patterns again from her “50 Fabulous Paper Pieced Star” book – this time Oklahoma and Ohio. My pieces count on this one is 100 – the Oklahoma block is a little fiddly. My next block for Nicole will be a more festive… which means I will throw in some red and maybe some green for good measure. So pretty! I think it’s very subtly Christmassy. And I agree with you about the Christmas quilts, even though it’s pretty cold where I am right now :). I must admit is still stinking cold here and I am not too fussy at the moment about what is keeping me warm – namely two pairs of socks, a wool scarf and a tacky fleece blanket! Christmas quilts make a good tablecloth when it is 90+ outside. I’ve seen some folks make two sided quilts – one side is Christmas and the other for another season. Still, you block is beautiful and does look like a lovely snowflake. That is a genius idea… one side Christmas and one side normal. I can get on board with that. Even growing up in Canada I don’t understand Christmas quilts. I want something I can snuggle all winter long, without it looking dated by Valentine’s. I agree. Hate to make something to hang in closet until Christmas. Quilts should be used all the time, even in Canada. Really lovely! Your Carol Doak mashups are looking quite good. Beautiful! This will definitely be the star of the quilt! Yeah I don’t get them either (and I’m not that into xmas to begin with, haha). Your block is very pretty and will surely give a nice touch to the quilt! Wow, beautiful block… They get better and better 🙂 it’s funny you saying that about Christmas quilts cos I was thinking the same. Just considering my (possible) Xmas table runner and the fact that I will feel compelled to use it throughout the year! Holy crapoly, woman – 100 pieces?!?!?!!!! I am awed and inspired as well as humbled – I want to do this, too!! These greys are stunners – well done, you!! I worked on wonky triangles PP strips today – very fast and not at all fiddly. Your pp wonky sounds interesting. Is it a pattern from a book or on line? Hi Cath – the Wonky Triangles is a pattern I bought from Craftsy – it is made by Owen’s Olivia (can’t remember her name!). It was only $1.99, and I’ve had so much fun with it! Thanks Elizabeth. I will check it out. I love Craftsy patterns. I LOVE it! It’s so perfectly a snowflake!!! Wonderful combination. I have that Carol Doak book and I’m looking forward to “mashing” some of them together. You are doing a sensational job of it. I can highly recommend mashing up the patterns. It is so fun. I like the grey as it makes me think of icy snowflakes. I’m so over seeing heaps of red, white, gold and green fabrics in Spotlight (remember Spotlight from Australia?). Your snowflake is delicate, subtle, pretty and cool looking, and I think it’s perfect. In fact, I’d like to see a whole quilt of snowflakes. You could snuggle up warm under a blanket of snow… I’m thinking it would go well with my 90+C Christmas decor, which is white, silver and pink! You’re a very talented lady! Oh pink is exactly what it needs. I had a blast in Spotlight when I was home in March. Picked up May Gibbs fabric and the DS Quolts Aussie line. It was expensive though…really friggin expensive. Oh yeah, isn’t it just. I’m very jealous of the great price of fabrics in the US, not to mention how much cheaper good sewing machines are. But I love that snowflake. If I weren’t in the middle of two other quilts, I’d be tempted to have a go. Love your snowflake star. 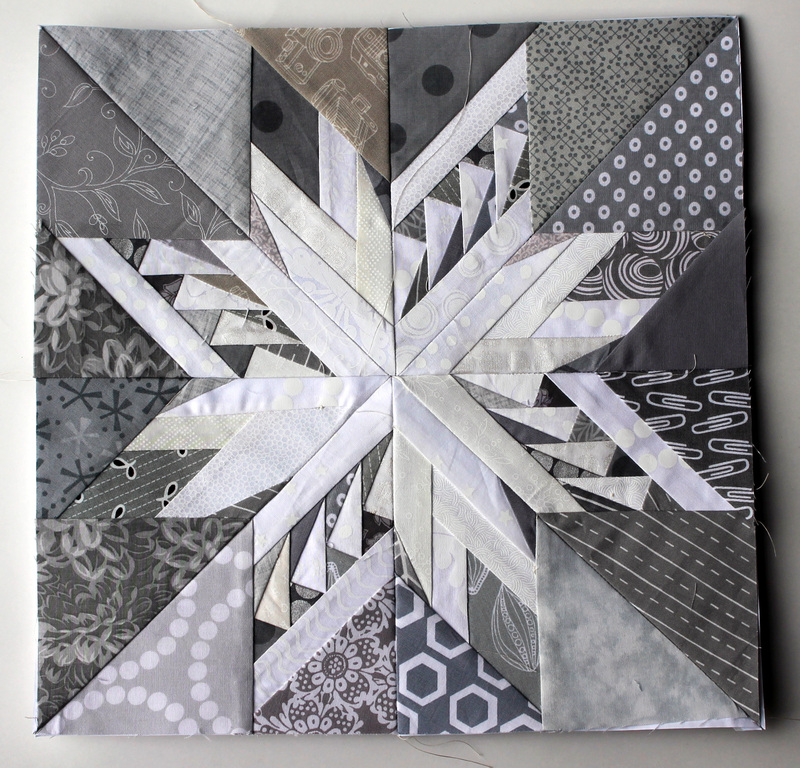 This idea of mixing star block is really great. Beautiful block. Love the way you took two concepts and created your own unique block. Genious combining patterns, the effect is ethereal! Very lovely block and absolutely speaks Christmas! I want to tell you that your aqua and grey piece is just outstanding. Jody. Thanks so much. Iam really thrilled with how the Icicle quilt turned out. I will be using that colour combination again. I love it! But, I love anything having to do with snow. I am with you on the snow love.. except for the frost bite bit. Not so keen on frost bite! Cath this is absolutely amazing. It has to be one of my all time favourites!!! I so understand your thought on Christmas!! Thanks Marie. I have a few more Christmas blocks to do so hope by the end of it all I have a better idea about why Christmas quilts. It’s gorgeous!! I just saw this on Pinterest, so had to come over and read more about it, and see what else you make! Wow! That is beautiful! I’ve found a simple paper piecing tutorial on You Tube an will be trying my hand at it for the first time this week-end. Wish me luck! 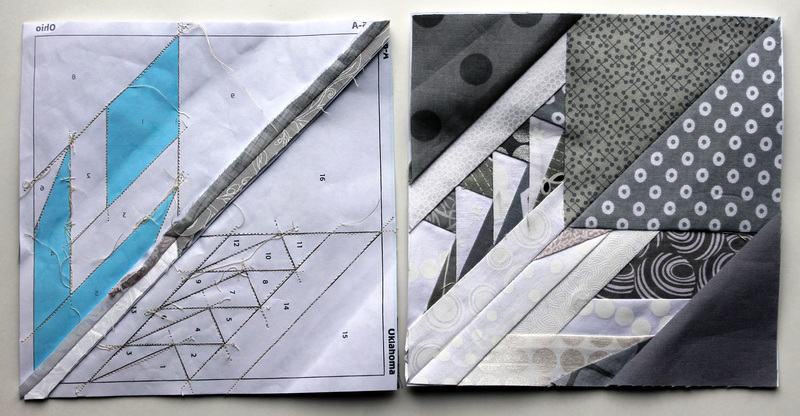 Good luck with the paper piecing… not that you need it. It is fun and addictive. Drop me a note if you get stuck or have any questions.